Learn Where Truly Is Voyager 1? Where Truly Is Voyager 1? It is a belief amongst many scientists the Voyager 1 Spacecraft already entered interstellar space. However an alternative hypothesis was presented by a team of scientists, one of which is George Gloeckler of the University of Michigan. 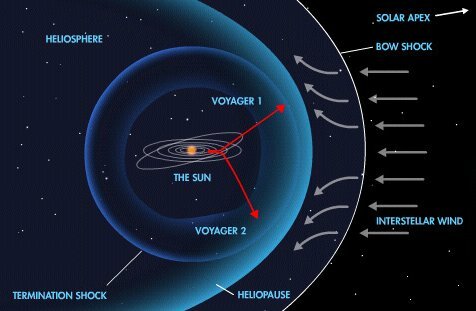 They are currently creating a test for Voyager 1 to prove if it is truly in interstellar space or still within the heliosphere- the bubble of magnetic fields and solar particles that the sun emits around itself. The idea that Voyager 1 has not entered interstellar space is an opposing claim to the statement made in August of 2012 by the Voyager 1 team which supposedly confirmed the spacecraft exited the heliosphere. The location questioning of the spacecraft is valid because though Voyager 1 has measured cosmic rays and alternate signs that it exited the heliosphere, it still hasn’t detected a magnetic field change, which is the evidence scientists like Gloeckler are searching for. Opposing viewpoints are a part of the scientific world and help increase our understanding of laws and theories through trial and error. Hopefully we will soon find the truth in this cosmic hide-and-seek game Voyager 1 seems to be playing with astronomers. Astronomy, Space, Voyager 1. Bookmark.